According to inquisitr.com, NASA's latest project involves a prototype plane that will be able to fly low enough to observe Martian territory while taking cartographic images and radiometric readings. Yes, it's basically just a drone, but an important one, considering the stakes we could make on our neighboring planet. Known in glorious NASA acronym-speak as the Prandtl-m (Preliminary Research Aerodynamic Design to Land on Mars), the plane is a 2.6-lb. glider with a 48-inch wingspan. A prototype is currently being designed to explore Mars sometime in the early 2020s, mostly to see if it's a nice neighborhood for humans to move into. "Charming acreage, perfect for new families..."
The Prandtl-m will weigh only a pound in Mars' reduced gravity, and is estimated to have a range of up to 20 miles (providing it is released from an altitude of 2,000 feet.) Tests will be made on the plane here on Earth by dropping it from 100,000 feet and allowing it to navigate itself back to its base over the course of five hours. Should these tests prove successful, the plane will be dropped from a sounding rocket at 450,000 feet to test it in its intended deployment configuration. The Prandtl-d, a precursor to the Prantdl-m, during a test flight in June. In official action, the Prandtl-m would launch from a 3U CubeSat (a stack of three small, squared satellites) that would be housed inside an updated Martian rover, also bound for the planet. 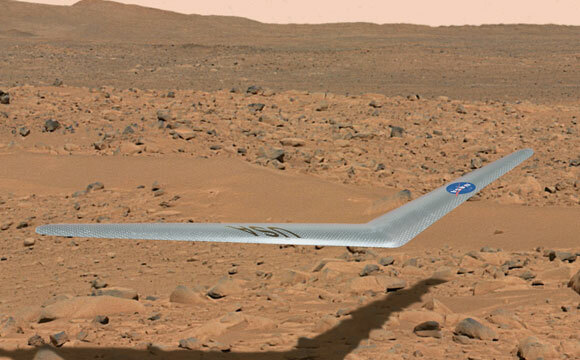 Should it be successful, the Prandtl-m will be the first aircraft on Mars (well, the first human-powered one, at least. We can't speak for any unaccounted-for aliens.) Though its flight time would only be around ten minutes, it could provide new data of unparalleled accuracy. Our grandchildren might be sand-skiing down Olympus Mons.